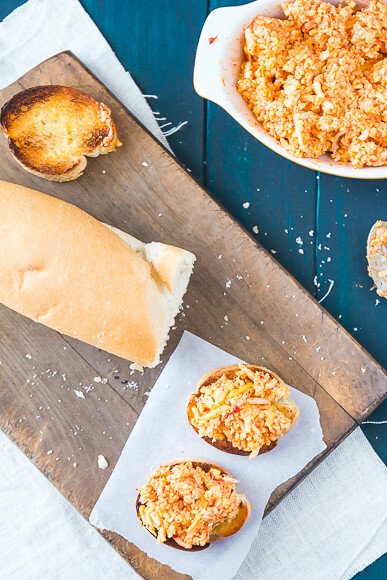 When it was time for our church’s dinner on the grounds, mom always made a towering plate of Pimento Cheese sandwiches, crusts removed and cut into 4 dainty triangles. Pimento cheese sandwiches and enchiladas, those were her potluck specialties. The store-bought variety is loaded with a lot of… stuff. It’s incredibly easy to make your own at home and skip on the the filler and preservatives. It’s essentially grated cheddar cheese (I use a mix of sharp cheddar and horseradish white cheddar for a kick), roasted red pepper, garlic, salt, and a dash of Worcestershire held together with as little mayo as possible. A food processor makes quick work of it but a cheese grater and a fork are just as effective. 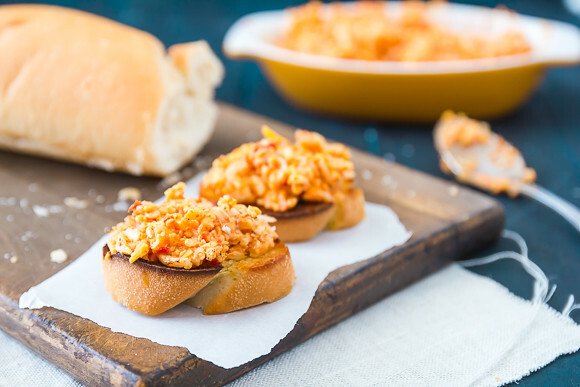 There’s almost nothing you can do with Pimento Cheese that will ever top slathering it on a slice of soft, smooshy off-the-shelf white sandwich bread. That doesn’t mean we can’t try. We eat it with crackers and baked pita chips. With toasted bread rounds. And on hamburgers with a fried green tomato slice. We call it “The Southern.” And as you’d imagine, we don’t have that one very often. Side note: Yes, we have names for every burger combo that we’ve ever eaten. It’s probably a little weird. The southern favorite gets a kick with horseradish white cheddar. If using a food processor, use the blade to shred the cheese. Remove a handful of cheese from the bowl and set aside. Switch to the chopper blade and add the garlic clove, 1/4 cup of mayo, a dash of Worcestershire, the red pepper, a pinch of salt and pepper and process 8-10 seconds. Return the shredded cheese to the bowl and pulse 1-2 times. Store in the fridge, will keep a week plus. If not using a food processor, grate the cheese and finely mince the garlic. Stir the minced garlic, Worcestershire, and mayo together with a pinch of salt and pepper. Finely dice the roasted red pepper and add it to the bowl along with the cheese. Stir until thoroughly combined and then take fork and mash the cheese until you reach desired consistency. I love the sweetness of the roasted red bell peppers, so I can imagine how delicious this must be when combined with the cheese! I LOVE pimento cheese! I haven’t tried making it myself though…I can now! 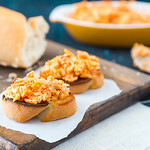 I have never had pimento cheese, I think I need to change that stat! I had a hankering for pimento cheese last weekend. One so bad I had to make two batches. We put it on bratwurst. It was devine! oh dear we are sisters from a different Momma. My Mom was a Hoosier and yep they did the same thing there. I so remember the picture of little Miss Sunbeam looking so perky on the bread wrapper. But with all that said I am still a pimento cheese lover and yes I just add plain old horseradish. Oh and once I didn’t have enough mayo so I used mayo and sour cream. This would be a fun party item! I love bringing spreads and dips to gatherings! Yum. Love pimento cheese made at home. I’m sure the horseradish cheddar is insanely good in it too, a nice bite! The best pimento cheese I’ve ever had is here in Atlanta at The Varsity. I don’t think they do anything special to it or add any secret ingredients. It’s so good because they melt it. Mmmmmmm. We just don’t seem to do pimento cheese this far up North. It looks really interesting though! Chips, queso and a margarita sounds like a tasty lunch to me! coming from the northeast, I kind of feel like I’ve been deprived of somethign really delicious for my entire life. I need to make up for lost time. Obviously. Thank you for featuring my recipe! It should be noted that I made those deviled eggs ‘for’ Josie, too! The recipe looks great, especially with the white cheddar, but how much pimento do you put in it? I use 1 whole roasted red pepper. I still love those little soft triangles, at church! Thanks for taking the time to document our little slice of heaven known as Houston. I have travelled all of the state as a professional cater and each of our states have thier own signature specialty’s. I currently live in the home of chicken spaghetti , east Texas but Houston will always be my home.